Many homes in the U.S. experience water drainage problems. Understanding the cause and finding the solution can be difficult. Most basements are connected to the house which means they “share the air.” Some homes use their underground area as finished living and bedroom space where moisture problems are not only uncomfortable and annoying but can also lead to health problems. Mildew and mold can grow under wall coverings and carpeting. Finishing a basement without dealing with moisture can result in health problems and lead to significant damage as well. A sealed interior basement waterproofing system, installed by a professional can keep the moisture and soil gases from circulating throughout your home. On the inside of your home, you may want to install an interior waterproofing drainage system. A square drain tile can be installed next to the footing below the concrete floor. 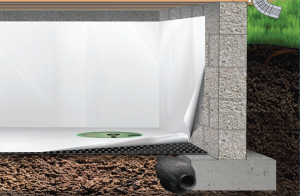 This system in conjunction with a vapor barrier wall covering directs water vapor to the drain tile, which will eliminate possible mold and mildew from entering your living space. This system also draws water from under the concrete to the sump pump, which guides the water outside. This method is recommended to ensure the safety of your family and possessions, along with promoting a healthy home. Sealed interior drain tile systems are designed for residential waterproofing and moisture control. It is essential that these be installed correctly since they are buried beneath the ground and cannot be corrected or modified easily. This interior system is less expensive and less evasive than exterior waterproofing. An interior drain system is not waterproofing. 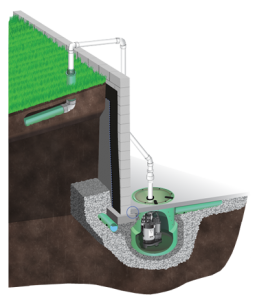 They are water management agents that relieve excess water from around and under the foundation and direct it to the sump pump system. The most effective of the interior drainage systems is a perforated drain pipe installed inside the perimeter of the footing. These are building code approved when installed and sealed correctly. In order to do this, it is necessary to remove and replace concrete around the slab edge. Then by placing the drain pipe beneath the slab, it drains the area to a lower level. This pipe then connects to the sump pump. 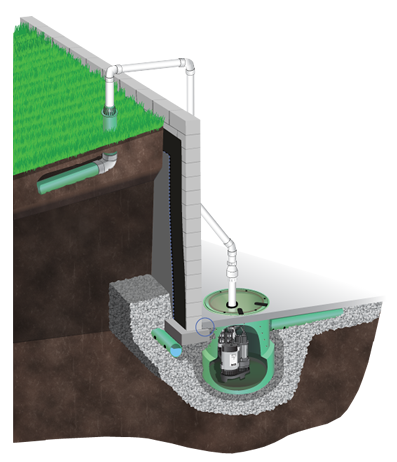 The sump basin should have a sealed, airtight, childproof cover. There will be a plastic liner at the base of the wall into the drain pipe that is dimpled, which permits free drainage at the base of the wall. As with all of our supplies and methods, it’s important to evaluate which method and materials are going to provide protection to your home for many years to come. Soil conditions and locations are a big factor in what solution is right for your situation. Rest assured that we will find the basement waterproofing solution that will repair what you already have or prevent water problems from arising. We pride ourselves in offering a wide array of solutions to protect your basement from water or to solve the basement water problem in your home. We strive to find affordable and individualized solutions for your particular situation. Our professional team has installed thousands of systems throughout Rapid City, South Dakota and the surrounding area. It is our desire to serve our customers with high integrity and expertise. 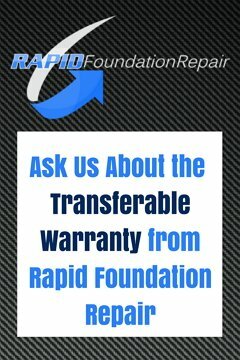 Contact us today in the Rapid City, South Dakota region for a personal consultation, professional advice, and quality workmanship.